There are a LOT of very smart people here! Thanks for the suggestion old school! After discussing this with the project team, the intent is to match existing. The spec will be revised to reflect this. I appreciate the input from you and the forum. This is a great resource and I'm going to share it with others here in my office! That will work. If you are going to use the grace along the bottom, I would cover it with the felt before you put the slates on. The felt will keep the slates from sticking to the grace and make it possible to repair them at some time in the future. For 18 - 20 inch slates, 5 inches is too narrow. I would use 10's 11's 12's and maybe 13's. as far as width goes. They have to be that wide to get the proper ofset from each other. Thanks for the response Old school, I plan on indicating a 3/8" cant at the eave for the starter slate. The slate is to match the existing slate on the rest of the building. 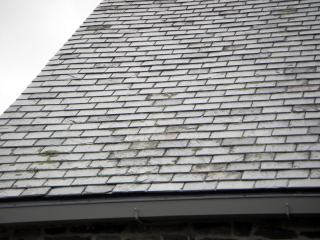 Spec's indicate random mixing of slate with the slates being 5"-10" wide x 18-20" long. Thickness varies between 1/4" - 1/2" so I figured splitting the difference and use a 3/8" furring strip at the starter course. Still plan to use ice & water shield over the eave of the plank and lap 15# felt for the rest of the roof. 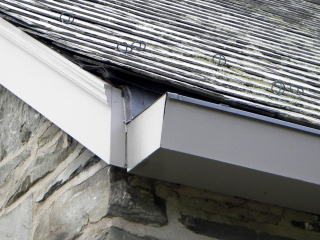 Hello, I'm looking for advice on a new small slate shed roof over an entry/exitway. Approximate roof size is 9'-4" wide x 12'-0" long. The roof deck is an 18" wide cementitious concrete plank 2" thick with t & g metal edging around it's perimeter manufactured by Martin Fireproofing. The plank bears on steel beams. You can nail/screw into this product however I wonder if a base layer of 3/4" plywood on top would be needed? I'm concerned that the metal edging of the plank will interfere with the nailing of the slate.